The Tigers trailed 14-0 early but rallied in the second half and Deshaun Watson connected with Hunter Renfrow in the final seconds of the game to secure the school’s second national title, its first since 1981, and doing so in the first national championship rematch. The defeat ended Alabama’s 14 game undefeated run this season and its 26-game win streak overall, dating back to last year. 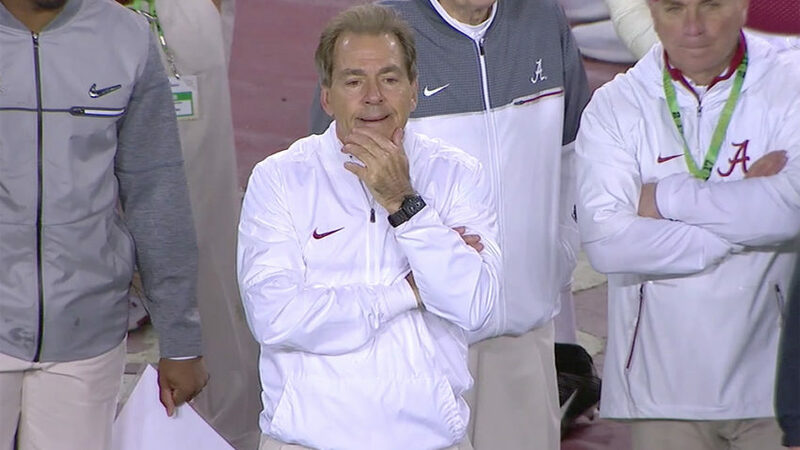 Head coach Nick Saban was also losing for the first time in a national championship game after going in with a 5-0 record. The defending champion jumped all over the Tigers when they struck first with a pair of Bo Scarbrough rushing touchdowns. 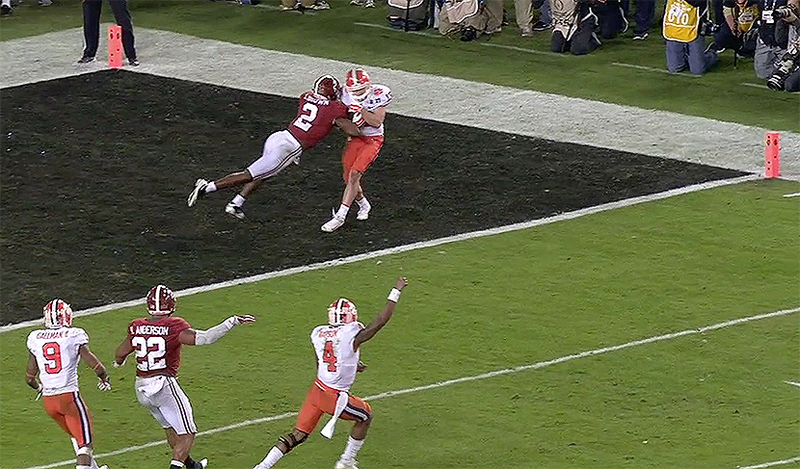 Alabama took over possession on downs when Clemson failed to convert on a 4th and 1 play. After turning the ball over, Tigers were also hit with a 15-yard penalty during the Crimson Tide’s drive and it helped to pave the way for running back Bo Scarbrough to score the game’s opening touchdown. Scarbrough took a handoff from his quarterback Jalen Hurts before zipping past a couple of Clemson defenders and then muscled into the end zone for a 25-yard touchdown run early in the first quarter. The sophomore back extended the advantage for Alabama when he moved to his left, broke a few tackles and burst upfield 37-yards for his second touchdown of the game to give Alabama a 14-0 lead in the second quarter. Fearing that the contest was slowly slipping away from them, Clemson offense finally decided to show up in the second quarter to get on the scoresheet. Deon Cain pulled down a 44-yard pass to move into Alabama territory and then DeShaun Watson got his team on the board with an 8-yard TD run after tip-toeing the sideline with 6:09 left in the first half. Hunter Renfrow managed to break loose on a crossing cut which freed him up to take a catch from Deshaun Watson for a 24-yard touchdown. However, another poor coverage on defense by the Tigers left O.J. Howard wide open on the left, and Hurts passed to him for a 68-yard touchdown, which extended the Tide’s lead to 24-14 with 1:53 left in the third quarter. It didn’t take long, though for second-ranked Clemson to strike back, as Watson picked out a free Mike Williams from 4-yards to cut the Tide’s lead to 24-21 one minute into the fourth quarter. Wayne Gallman gave the Tigers their first lead of the game with a 1-yard run with 4:38 left, but the Crimson Tide rolled back through quarterback Hurts, who ran home for a 30-yard score with 2:07 remaining. Trailing 31-28 and needing a big play, experienced star quarterback Watson found Renfrow with a 2-yard touchdown pass to win the game. Watson, who declared for the 2017 NFL Draft after the game, finished his college career by passing for 420 yards on 36 of 56 attempts with three touchdowns, while running for another 43 yards and a score for the Tigers. Scarbrough ran for 93 yards and two scores for Alabama, while O.J. Howard took four catches for 106 yards and a touchdown. Hurts ran 63 times for 63 yards and a score but struggled throwing the ball after going 13 of 31 for 131 yards with a touchdown.